IAM District 751 members Mark McGarrity, Anthony Alsted and Darren Gremmert pose with Brad Davis (second from right), whose life they saved. 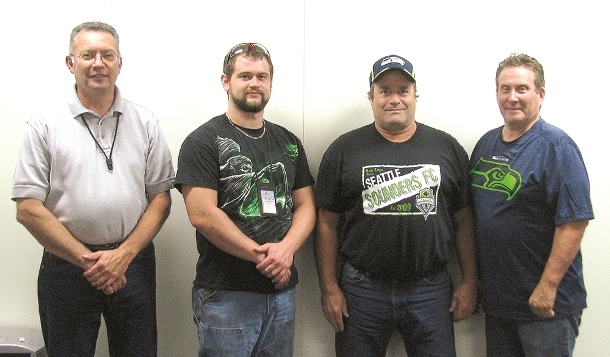 Two members of IAM District 751 have received the Governor’s Lifesaving Award for quick actions that saved the life of a Boeing Co. co-worker. The incident occurred early one morning in August 2014, at the start of first shift at Boeing’s Everett, WA factory. Brad Davis, who was sitting in a chair, suffered a heart attack. Fellow union member Anthony Alstead helped Davis out of the chair and onto the floor, and began calling for help. Machinists Randy Walbrun and Darren Gremmert responded and began performing chest compressions while also calling 911. Boeing supervisor Mark McGarrity joined them and helped with chest compressions until Boeing Fire Department personnel arrived and delivered shocks with a defibrillator before taking Davis to a hospital. Doctors told Davis later that it is extremely rare for someone to survive a heart attack that severe, but the quick action of his co-workers and union brothers saved him. Alsted, Gremmert and McGarrity were honored October 8, 2015 at the annual Governor’s Industrial Safety and Health Conference. (Walbrun was also nominated but declined the award.) They were among 32 people from around the state who were honored for actions that saved the lives of co-workers in 2014. Originally formed in 1935 by hourly workers at Boeing, District 751 represents more than 33,000 working men and women at 52 employers across Washington state and California.